Every small business owner knows that sticking to an operation budget is a key component to making a business successful. A business budget template allows you to create a budget and keep track of your budgeted expenses. You can download a business budget template for free. 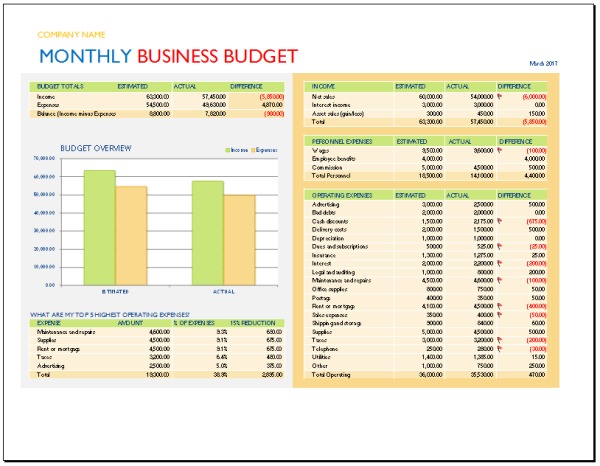 Another monthly business budget template keeps things simple and easy. There are four sections. The summary is placed at the top. It summarizes the total income and the total expenses and gives you an estimated profit. Below the summary is your income details. You can designate a row for all your different income streams. The columns allow you to input your estimated budget, your actual budget, any over budget expenses or under budget expenses. The fourth section is for administrative details. These business budget templates are easy ways to keep your recorded keeping more efficient and to help you gain a better understanding of how your company is fairing financially.